Zebra longwing butterfly photo by Patricia M. Ciesla, Forest Health Management International, Bugwood.org: zebra longwing (noncommercial use permitted with attribution). 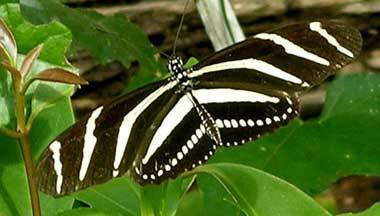 The zebra longwing butterfly is found throughout Florida in hardwood hammocks, thickets, gardens, and particularly in the Everglades National Park. The zebra longwing butterfly is characterized by long black wings with distinctive thin stripes and a slow, graceful flight. It makes a creaking sound when alarmed. Zebra longwings feed on nectar and pollen. They are the only butterflies known to eat pollen, which is probably why they have a long lifespan (about six months, as compared to a more usual one month for other butterfly species). The zebra longwing butterfly lays its eggs on passion vine leaves. Passion vines contain toxins that are consumed by the caterpillars, which make the adult butterflies poisonous to predators. 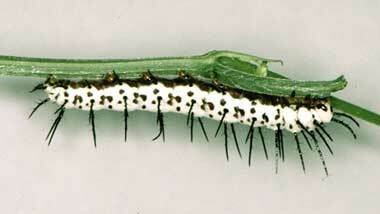 Zebra longwing butterfly caterpillar; photo by Jerry A. Payne / USDA Agricultural Research Service / Bugwood.org (noncommercial use permitted with attribution).